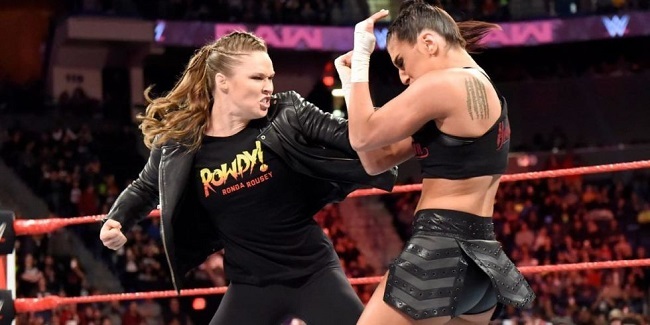 WWE’s Ronda Rousey (left) clashes with Sonya Deville in the ring. On April 8, World Wrestling Entertainment put on what is annually its biggest event on the calendar: “WrestleMania 34” from the Superdome in New Orleans, Louisiana. The show prominently featured a match involving former MMA superstar Ronda Rousey and WWE co-owner Stephanie McMahon, as well as two WWE Women’s Championship matches and a 20-woman battle royal. On April 27, WWE will put on a first-time event that could be even bigger than WrestleMania in terms of star power, match quality, sheer size and profitability: the inaugural “Greatest Royal Rumble” from King Abdullah Stadium in Jeddah, Saudi Arabia. The show will not feature any female wrestlers. If you didn’t already know, Saudi Arabia is in many ways the epicenter of the Muslim world. The holy cities of Mecca and Medina are both located in Saudi Arabia, an obviously Muslim-majority country with a monarchy-style government that adheres to many Islamic laws. The Quran has been declared the constitution of Saudi Arabia. And for decades, the issue of women’s rights has been a controversial topic in Saudi Arabia. Restrictions placed on the rights and privileges of women in the country have drawn protest from citizens and outsiders alike, and many Muslims have argued that the Saudi society’s treatment of women does not align with the true principles of Islam or with the teachings of the Prophet Muhammad (peace be upon him). Women were not allowed to vote in Saudi Arabia until 2015. Women were not allowed to drive until 2017. To this day, women still need permission from a male guardian (husband, father, brother, etc.) to open a bank account, travel, and get a job, among other things. Saudi women are of course required to dress with extreme modesty. There is not a lot of gender-mixing in Saudi culture, which prevent activities such as men and women playing sports together. It also means men often cannot watch women compete in sports, and vice versa. So it’s really not a surprise that the organizers of a WWE event in Saudi Arabia would frown upon the idea of women in the ring wearing revealing wrestling tights, twisting each other into submission holds and simulating a fight in front of a mostly-male audience that may include the country’s royal family. While there will be women in the crowd at the Greatest Royal Rumble — families (including wives and daughters) are being encouraged to attend by ticket-sellers — there won’t be any women in the ring. The surprising part is that the WWE is on-board with this. For a company that has gone to great lengths in recent years to reinvent the way it utilizes its on-air female talent and portray them as serious competitors rather than just eye candy — an effort they’ve actually branded “The Women’s Revolution” — it would appear WWE is taking a big step backwards by participating in a show that essentially won’t allow female participants. Or maybe it’s not surprising at all. The Saudi General Sports Authority clearly paid a lot of money to WWE to make this event happen, although the exact number is not yet known. The Greatest Royal Rumble is, according to a WWE press release, the beginning of a “10-year strategic multi-platform partnership” between WWE and the Saudi government. This would not be the first time, and certainly will not be the last time, that we see a company (or an individual) prioritize money over a social cause. It would be nice to see a man as powerful as WWE’s CEO Vince McMahon take some kind of stand for what they believe in — if in fact it is the Saudi sports authority that pushed to keep women off this wrestling show. It’s not like WWE has no experience in this area. WWE has run events in Muslim-majority countries recently in which women did wrestle. In 2017, a match between Sasha Banks and Alexa Bliss (both four-time WWE Women’s champions) in the United Arab Emirates was viewed as a monumental occasion in a country that had prohibited women’s wrestling up until 2016. It’s also possible that WWE is going along with the no-women thing for now as a strategic (there’s that word again) form of playing nice with its new business partner, with plans to talk their way into getting its female wrestlers involved in return visits to Saudi Arabia over the course of this 10-year deal. I think what we have here is a simple clash of cultures, and in these situations there will always be some give-and-take. As a WWE fan myself who is Muslim and who doesn’t agree with a lot of the ways Saudi women are treated, I will still watch the Greatest Royal Rumble show. And I’ll keep an eye on how WWE and how the Saudi sports authority proceeds with things over the next decade working together. Another potential plot twist to watch in Saudi Arabia involves WWE star Finn Balor. He is booked for the Greatest Royal Rumble to compete in a four-way match for the Intercontinental championship. At WrestleMania, Balor wore rainbow-colored ring gear and promoted a message of LGBT acceptance. Will Balor do the same in Saudi Arabia? Will he be allowed to? Another WWE character known as Goldust could be a controversial figure. He is listed as one of the competitors in the big 50-man Royal Rumble match. The Goldust character has a history of cross-dressing and homosexual innuendo. Will he be allowed to do his thing at this show, or will he be asked to tone it down? Given the current role Goldust plays in WWE’s weekly TV programming (in short, he’s not doing much), I don’t think it’ll be an issue. He’ll most likely just be lost in the shuffle of a massive 50-man match. Two of WWE’s current wrestlers are Muslim, from what I know. Sami Zayn (real name: Rami Sebei) is a native of Canada who is of Syrian descent, and Mustafa Ali (real name: Adeel Alam) grew up in Illinois in a Pakistani family. Ali lost a WWE Cruiserweight title match to Cedric Alexander at WrestleMania, while Zayn was part of a tag-team match at WrestleMania. Neither Ali or Zayn has been officially announced as part of the Greatest Royal Rumble card, but they could both appear in the 50-man rumble. Alexander is scheduled to defend his title in a match at the show and no opponent has been named yet, so Ali could wind up getting another title shot.